IRON RIVER — Nancy J. Bastianello, 84, of Iron River, passed away on Friday, Nov. 10, 2017, at Aurora Bay Care Medical Center in Green Bay, Wis.
Nancy was born Nov. 11, 1932, in Iron River, the daughter of the late Reino and Cecilia (Karnack) Lake. She was a lifelong resident of the area. She attended Iron River Schools, graduating from the Iron River High School in 1951. While in high school, Nancy was a cashier at Mehlstrom’s Drug Store in Iron River. Nancy married Anthony “Tony” Bastianello on Sept. 27, 1952, at the St. Agnes Catholic Church in Iron River. The couple celebrated their 45th wedding anniversary in 1997. Tony preceded her in death on Oct. 9, 1997. She was employed at the West Iron County School System as a teacher’s aide for 26 years and also as a waitress at the Iron Inn Motel for many years. 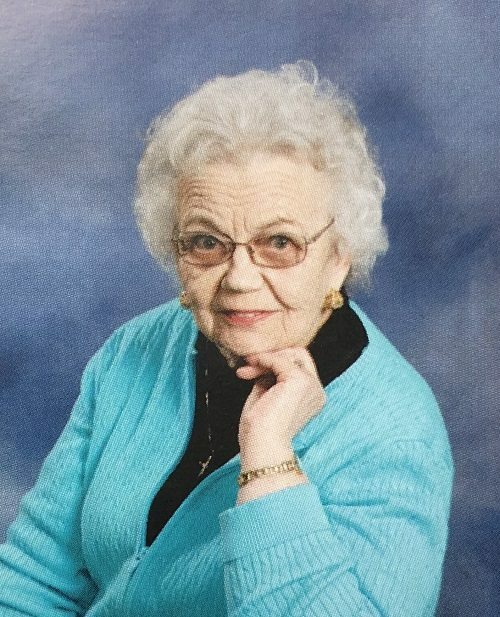 Nancy was a member of St. Agnes Catholic Church of Iron River, the Rosary Sodality, Iron County Ultreya, and a former member of the Blessed Sacrament Church. Nancy loved to crochet, knit, and make raspberry jam and spaghetti sauce. She also loved to play with her great-grandchildren and walk in the woods at her lake house. She is survived by her son, Don (Carol) Bastianello of Iron River; daughter, Toni (Dennis) Gevaert of Green Bay, Wis.; grandchildren, Joshua (Erica) Bastianello of Cedarburg, Wis., Jerod (Katee) Bastianello of Wrightstown, Wis., Jenna (Matt) Epkey of Grand Rapids, Matthew (Kelly) Gevaert of Green Bay and Marlee (Edward) Hunt of Green Bay; great-grandchildren, Vincent and Amelia Bastianello, Reed, Claire, and Grace Bastianello, Isaiah, Owen, and Elise Epkey, Payton Jeske, Jackson and Alessandra Gevaert, and Ariauna Hunt; brother, Reino (Arlene) Lake Jr. of Iron Mountain; sisters, Marie (Michael) McMahon of Pickett, Wis., and Vicki Lantz of Hillsboro, Ore.; sister-in-law, Josephine (Bastianello) Keliin; and many nieces, nephews, and extended family. Nancy was preceded in death by her brothers-in-law, August Bastianello and Joseph Lantz; and sisters-in-law, Clare, Emma, Perina, Bernice and Irma. Visitation will be from 9 to 10:45 a.m. Saturday, No. 18, 2017 at the Jacobs Funeral Home in Iron River. Funeral services will follow at 11 a.m. at St. Agnes Catholic Church with Rev. Gregory Veneklase to offer the Mass of Christian Burial. The Rosary Sodality will form an Honor Guard at the service. Pallbearers will be Joshua Bastianello, Jerod Bastianello, Matthew Gevaert, Albert Gasperini, Brian Keliin, and Matt Epkey. Honorary pallbearer will be Dale Keliin. Interment will be in Resthaven Cemetery, Iron River. In lieu of flowers, the family suggests memorial donations be made to the Iron County Cancer Unit, P.O. Box 45, Iron River, MI 49935. Condolences may be expressed to the family of Nancy J. Bastianello online at www.jacobsfuneralhomeir.com.